The Football Fans online slot machine from Playtech brings all the excitement of the touchline into your home. It’s a typical looking machine, with the usual free spin bonus round present. 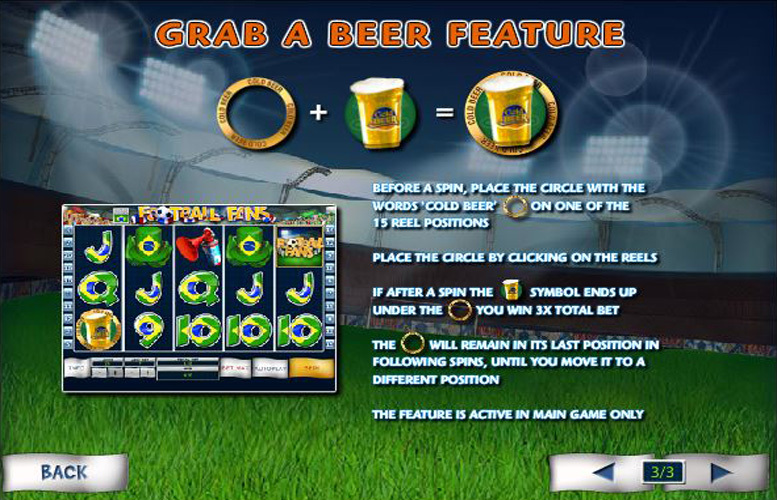 However, gameplay is kept exciting with additional features such as the penalty kicks during free spins, as well as the “Grab a Beer” feature. There’ll be more about these later, for now get comfortable in the stands, and prepare to cheer your team onto victory, as we explore what else the Football Fans slot offers players. Interesting and exciting bonus round. The additional wilds that appear during the free spin bonus are a good way of mixing up the action. Options to set the number of coins you bet per line, and the value of each. This means there’s tones of variation when it comes to choosing how much to stake per spin. Visually quite repetitive. 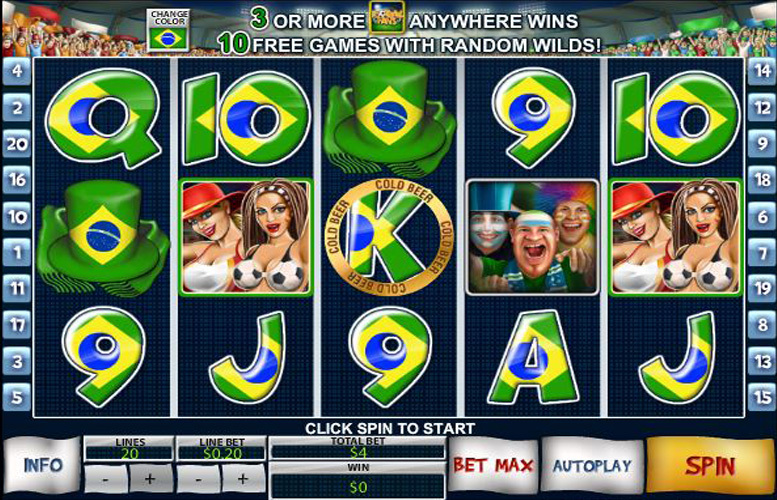 The colours of the Brazilian flag on most symbols makes this slot on the less stimulating side appearance-wise. The lack of additional bonus screens away from the traditional three row, 5-reel view don’t help engage players. “Grab a beer” is a nice additional touch but doesn’t really pay highly enough for it to be that exciting. Feels quite dated compared with many of today’s slots. The symbols for Football Fans are all inspired by the sights, and sounds of the stadium. There’s a mean looking bunch of fans, a pint of beer, some buxom looking footy females, a hat, and an airhorn. Additionally, there’s some lower value symbols but we’ll get onto those later. The highest value symbol is the “wild” which pays a substantial 5,000 coins for five across all reels. Next is a group of tough looking football fans, earning players 1,000x their coin value. Following these are some female fans, and the pint of beer. These two reward the player with 750, and 500 coins respectively. Finally, both the hat, and the both horn are worth 250 coins for five-of-a-kind. The maximum possible coin value being £5 makes for a huge total jackpot of £25,000. Not bad for a punt on the footy, eh? Despite its lack of variation when it comes to a bonus rounds, there are some neat features which makes the Football Fans slot stand out from other similar machines. 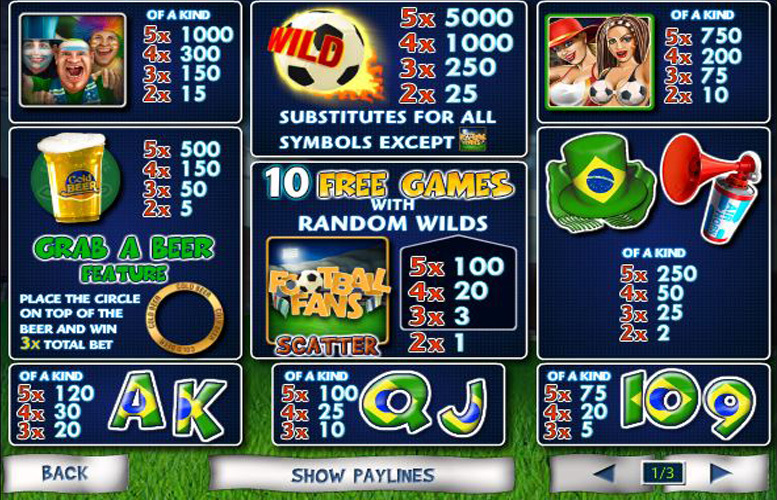 As mentioned, the “scatter” symbol is represented by the Football Fans slot game logo. Three of these symbols appearing on any reels trigger the game’s main bonus round. Like many slots, this consists of free spins. 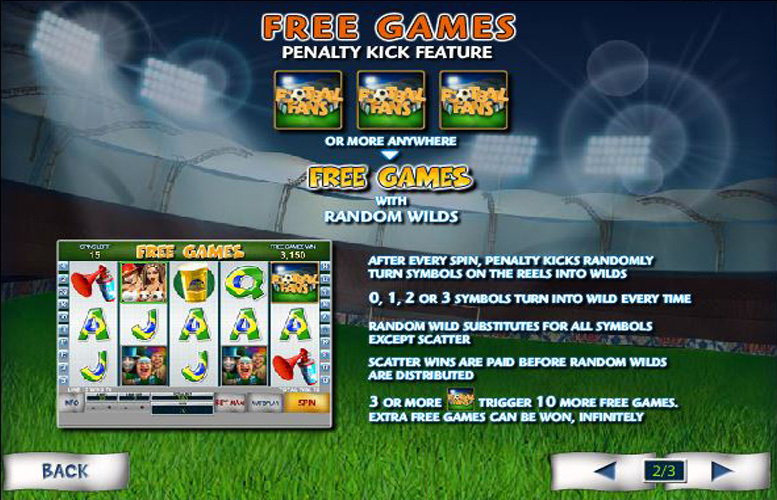 However, rather than add multipliers to winnings, additional wilds appear on the reels as penalty shots are taken. For each of the ten freebies, a random number of additional wilds will appear on the board (between zero, and three). It’s also worth noting that extra free games can be won when playing through free spin bonuses. This can also continue indefinitely. Another interesting feature of this slot machine is the “grab a beer” bonus. Here players can select where they think a pint of beer will appear for each pint. If they’re fortunate enough to guess correctly, they’ll be paid out at 3x the coin bet’s amount. Whilst this is somewhat of a novelty at first, the low value of the prize for a correct call means constantly changing your guess gets old quickly. In addition to the high value symbols listed earlier, there are a few lesser value squares that still pay prizes. These make up the card values between Ace, and number nine in a standard deck. Ace, or King = 120x the coin value. Queen, or Jack = 100x the coin value. 10, or 9 = 75x the coin value. One of the major selling points of the Football Fans slot is surely the number of variables players can tweak to adjust their bet size. They can choose any number between one and 25 pay lines active at once, and can pick between one and ten coins to stake per line. You can also change the value of your coins too. This means that the smallest possible bet is 1p, and the largest is a considerable £1,250 per spin. Personally, this one’s not for me. I’m not massive on football anyway, and the bonus rounds just aren’t that exciting. Couple this with the overall dated feel of the machine, and the lack of visual or aural stimulus – it makes for a game which is a bit of a let-down, all told. This might be more of one for the die-hard football supporters who may hear the authentic touchline sounds, and have memories of some emphatic victory by their team stirred, however. This game has a rating of 3 / 5 with 283 total reviews by the users.